Howard Carter Lease Ltd – Certified Pre Owned Vehicle Advantage! About Us | Employment Opportunities | Meet Our Team | Leasing Application – APPLY NOW! 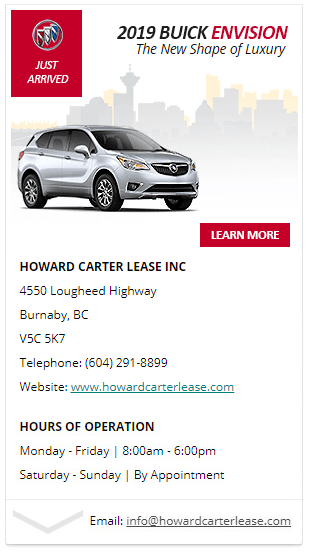 At Howard Carter Lease in Burnaby – all of our pre owned vehicles come with a 150+ point inspection, a Manufacturer’s Warranty, 24-hour Roadside Assistance and an Exchange Privilege. We gladly back our Certified Pre-Owned Vehicles with a manufacturer’s warranty. It guarantees that qualified technicians who use factory-approved parts will service your car or truck. Additionally, our customer’s are afforded further peace of mind with a minimum of 3 months or 5,000 kilometers (whichever comes first) ‘Used Vehicle Limited Warranty’ when purchasing a Certified Pre-Owned Vehicle – that’s standard. Furthermore, we provide service extensions or upgrades to an even more comprehensive Certified Pre-Owned Vehicle Protection Plans too. And should you ever decide to sell your vehicle, you’ll be able to transfer any existing warranties across to its new owner. Manufacturer’s Warranty – All GM Certified Pre-Owned Vehicles feature a minimum of 3 months or 5,000 kilometers (whichever comes first) fully backed by the manufacturer. It’s going to be a great ride, especially knowing you’re covered with a minimum of 3 months or 5,000 kilometers (whichever comes first) of 24-hour roadside assistance. That includes trip interruption coverage and trip routing service to help you quickly get on your way. To receive Roadside Assistance, simply call 1-800-268-6800 and a service operator will be dispatched to the scene. If your vehicle can’t be repaired on-site, it will be towed to the nearest GM Dealership or GM authorized repair facility. If you need to pull your vehicle out of mud or snow, you’re covered for winching service, up to $100 per occurrence.